Marist College's The FOLD is a student-designed and delivered learning initiative combining a Web site, MOOC and open online community. Marist College has honed its learning technology innovations for decades and is not new to the Campus Technology Innovators award program, having received previous recognitions in 2006 (Identity Quest podcasting) and 2013 (Open Academic Analytics Initiative). Its latest innovative program, launched in February 2014, is a student-driven online collaborative learning environment called The FOLD (Fashion Online Learning Domain). 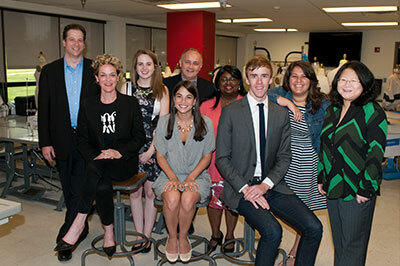 The inspiration for The FOLD, and what makes it unique among online learning initiatives, is the firm belief among Marist Fashion Program faculty and learning designers that students can generate knowledge from one another. With the oversight of project lead Radley Cramer, Marist's Fashion Program director, the students themselves created a project Web site; designed and delivered The FOLD's first MOOC in Spring 2014; and are managing an open, ongoing online community. The content focus of The FOLD is based on the tracking of street trends in fashion. Students around the world are asked to participate by spotting trends, taking pictures and posting and commenting on the trends. The initiative is designed to open up the academic learning environment to be inclusive of Marist students and faculty, students from around the world, the fashion industry and the interested public. "The way we like to describe The FOLD is a living learning experience around the topic of fashion scholarship, and a collaboration between people with a common interest in cultural phenomena, fashion, trends and change," said Melissa Halvorson, visiting professional lecturer at Marist. Behind the scenes, the initiative relies on the cloud technology that forms the college's Academic Community Cloud (ACC): Sakai and the Open Academic Environment, both open source software from Apereo, the nonprofit foundation that was formed out of the merger of Sakai and Jasig. Marist's Fashion Program — in partnership with the college's Enterprise Computing Community — is the first academic center to pilot the ACC at Marist, so The FOLD will serve as a model for the institution's strategic cloud initiative going forward. A key element of The FOLD and other academic learning communities forming within Marist's academic cloud is the ability to extend the reach of the college's academic programs to industry and to global partners. This both offers students a real-world, often international experience of their field of inquiry, and brings community professional interaction to academic programs. Cramer sees The FOLD having a significant impact on the fashion industry: "Our next step is to expand the outreach to the industry. One of the most interesting things about fashion as an industry is that it's so driven by change. The FOLD is the perfect venue to communicate rapid changes in fashion trends, or consumer change in how products are evaluated. There are lots of ways to get an early reading from the students, which will, I think, become very interesting to the industry: In the same way that students are educating each other, they are also educating people who are responsible for the 'big picture' within the industry."